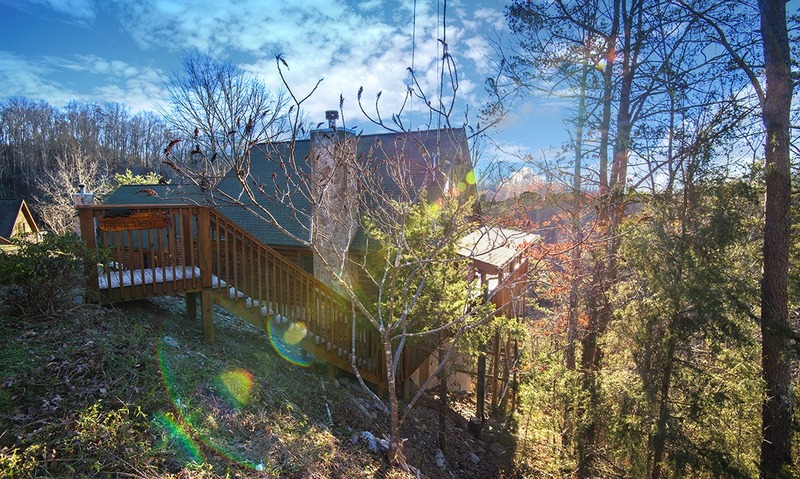 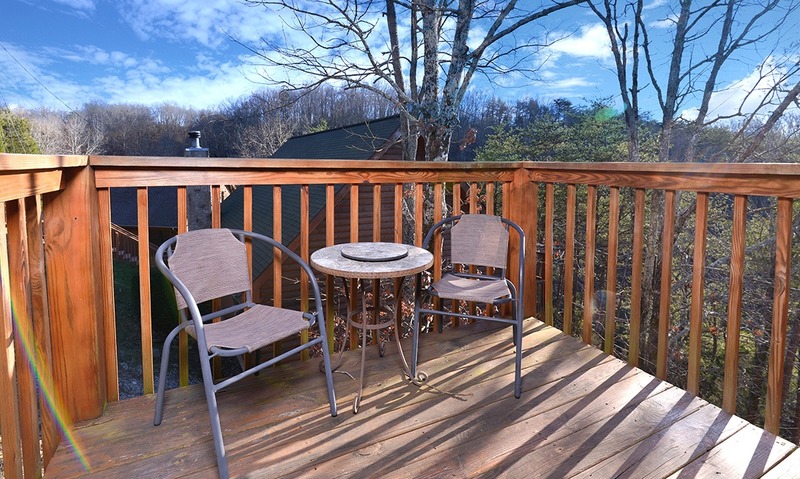 Head down the stairs and into the Smoky Mountain woods where a 2-bedroom cabin full of convenient extras and fun awaits. Knotty Desire may sound like it’s meant for romantic retreats only, but actually this 2-bedroom plus loft, 2-bath cabin can sleep up to 6 guests, making it a great choice for 2 to 3 couples hoping to vacation together or a single family getaway. 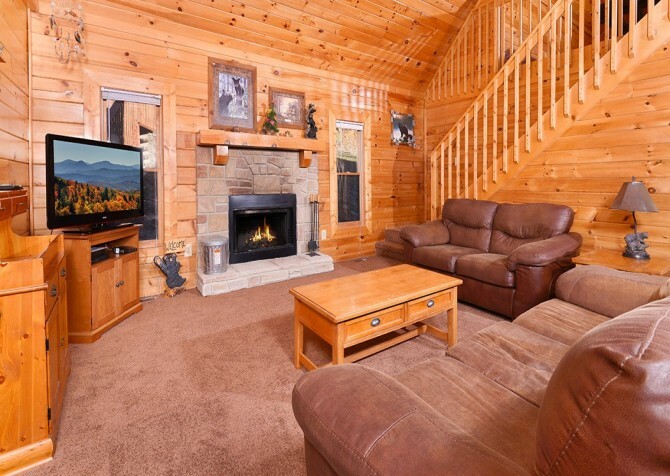 This cabin comes with plenty of exciting amenities for your Pigeon Forge retreat, including an outdoor hot tub, a pool table, a big screen TV with a DVD player, and pool access. At Knotty Desire, you’ll also enjoy multiple deck spaces with comfortable seating and a cozy interior, offering your group everything you need to relax and unwind while you’re away. 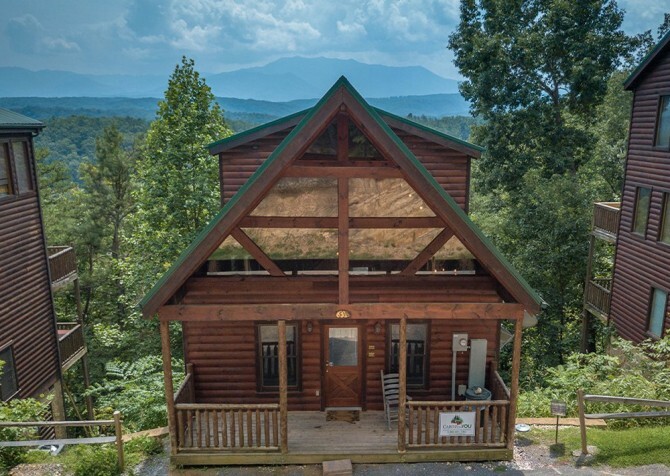 And this cabin is only 10 miles from downtown Pigeon Forge, so you’ll have access to all the fun of Smoky Mountain attractions while you enjoy your “Knotty” cabin in the trees. Warm, cozy, comfortable. 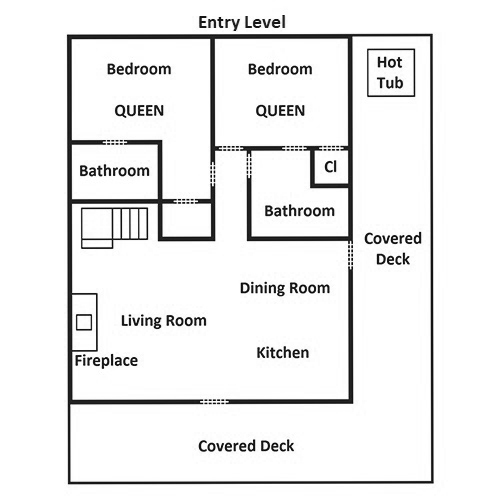 These words perfectly describe what you’ll experience throughout Knotty Desire, beginning in its large living room. 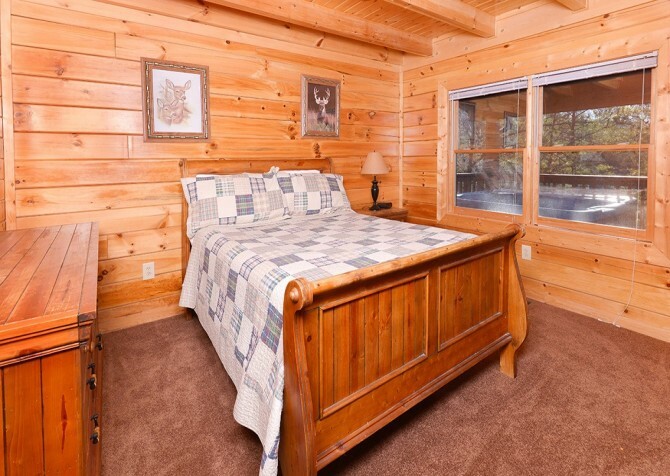 The warm wood walls and carpeted floors offer you a relaxing space to unwind after your long drive to Pigeon Forge and after long days of adventuring downtown. There are plenty of family/couples' activities awaiting you in Pigeon Forge; for ideas on where to go and what to do, check out our Pigeon Forge attractions page. 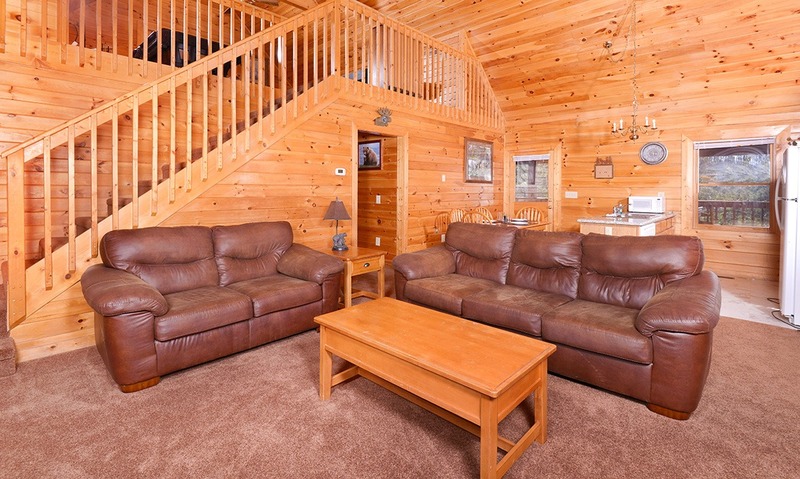 Outfitted in authentic Smoky Mountain décor (including pictures of the symbol of the Smokies, the American Black Bear), the Knotty Desire living room contains 2 brown leather couches—1 full-size and 1 matching loveseat. 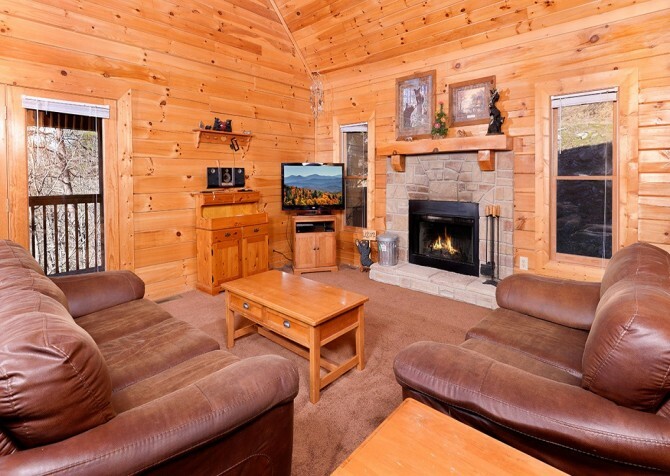 Most, if not all, of your group should be able to comfortably squeeze into this space, where you can watch a favorite movie on the big screen TV and DVD player, play a game on the large coffee table in the center of the room, or simply swap stories in front of the stone fireplace. This wood-burning fireplace provides the perfect place to relax on a chilly evening in the Smoky Mountains. 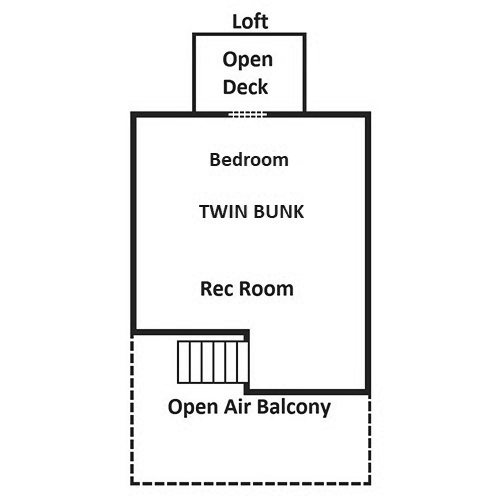 The open-concept design of Knotty Desire means you’ll be able to see the living room and dining room easily while you prep and cook in its full-size kitchen. This space comes with all your major appliances in white—including a full-size refrigerator, oven, stove, and microwave. 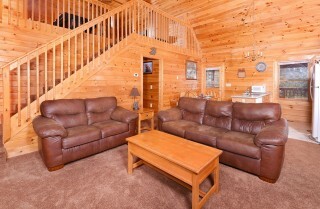 You’ll also have access to a coffeemaker (an essential for all of us caffeine addicts!) 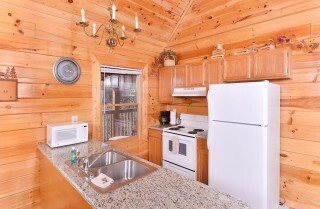 and plenty of cabinet space for storage of all your favorite goodies. 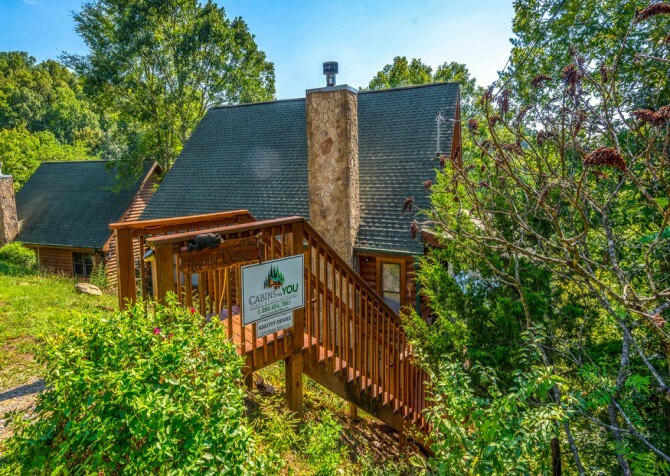 When you get to Pigeon Forge, we recommend a stop at The Old Mill Farmhouse Kitchen, where you can find stone-ground flour, jams, and jellies to enjoy during your Smoky Mountain retreat. 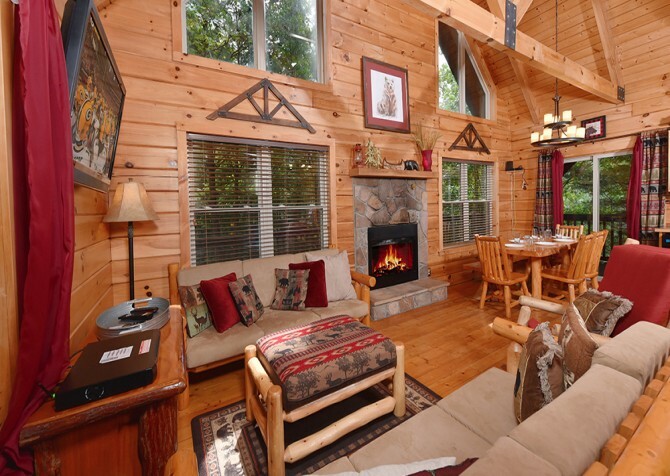 You can plan for easy group meals in the cabin for breakfast and delicious dinners at favorite Smoky Mountain restaurants. 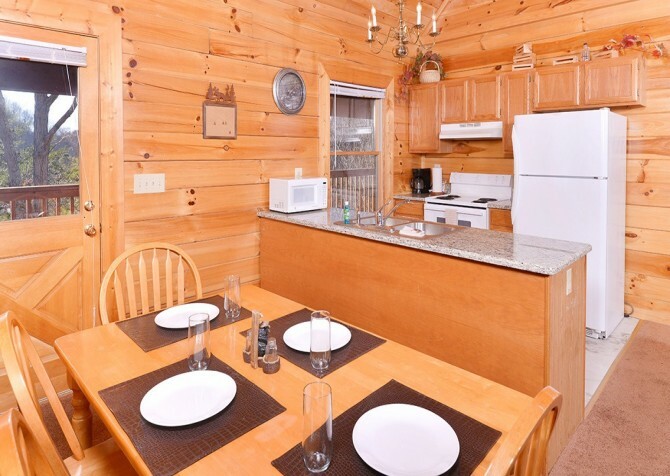 The dining room of Knotty Desire features everything you’ll need for meals with your group. 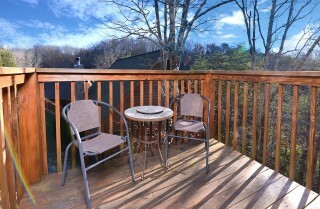 A wooden table with 4 chairs is just the right size for a 2-couple getaway or a family of 4. 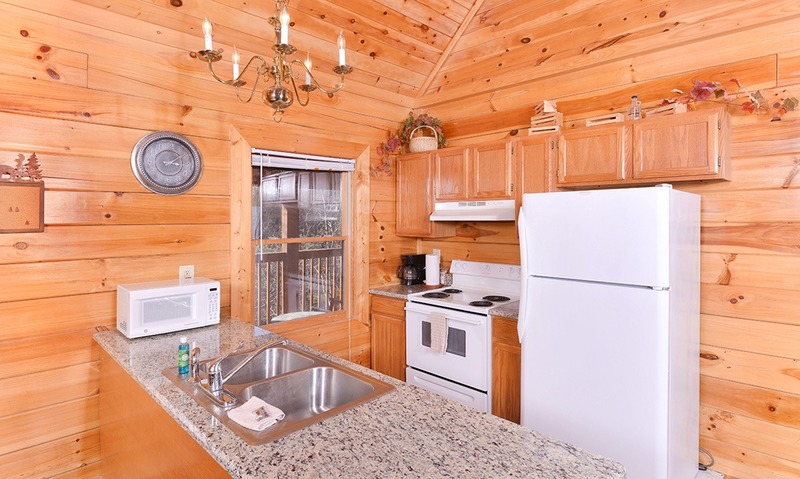 If you need more space than that, remember that Knotty Desire is an open-concept cabin, meaning you can spread out and still be part of the conversation during mealtime. The dining room will be a beautiful place to enjoy your meals together. 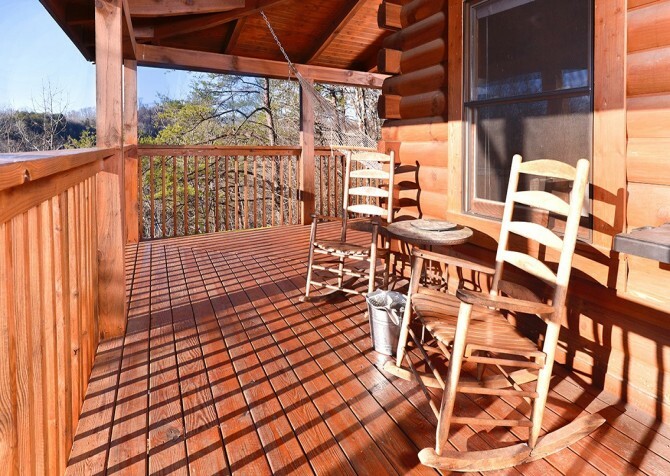 The large window over the door to the porch lets in tons of natural light, and after days amidst the hustle and bustle of downtown, you’ll be ready for some quiet meals in the cabin with the ones you love. Up the stairs of Knotty Desire is one of the more unique rooms within this cabin. 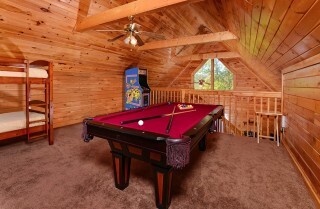 The loft has a pool table for hours of fun. When you finish playing board games in the living room, simply head upstairs for more fun and games inside Knotty Desire! 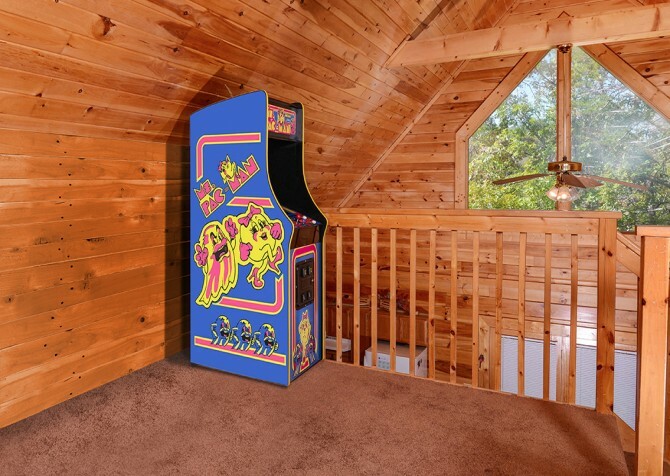 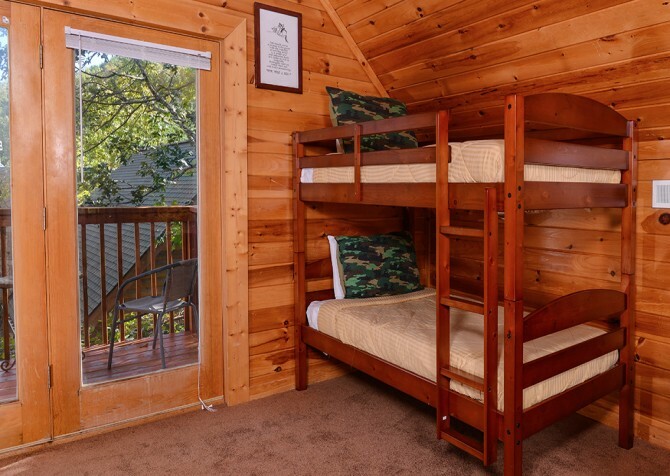 This room also has a twin bunk – which is perfect for kids or extra guests on your Pigeon Forge getaway – and large, floor-to-ceiling windows that offer views of the trees during your getaway. 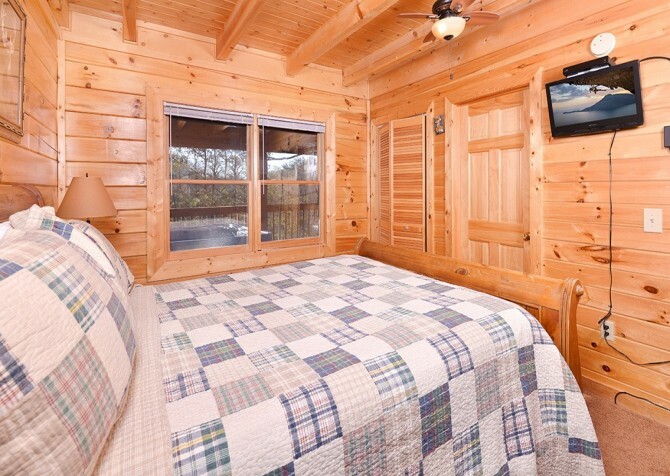 Besides the queen-size bed in the loft, Knotty Desire features 2 bedrooms, each with a beautiful sleigh bed fitting a queen-size mattress, a mounted TV, and large, side-by-side windows. 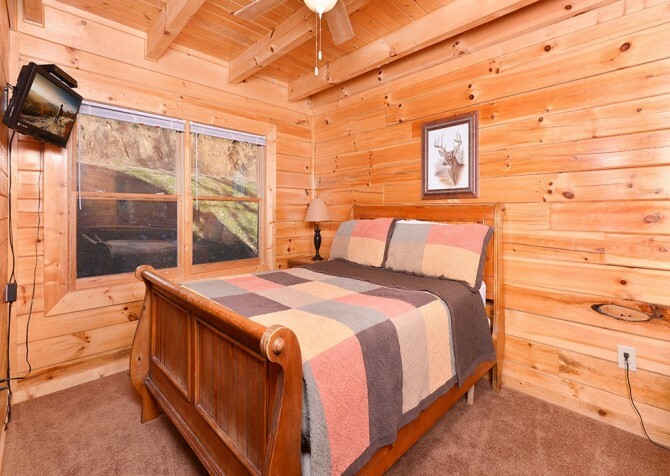 Total, you’ll have sleeping space for 6 guests in this cabin, and each bedroom comes with a companion, full-size bathroom—plenty of space for getting ready in the mornings and showering off in the evenings. 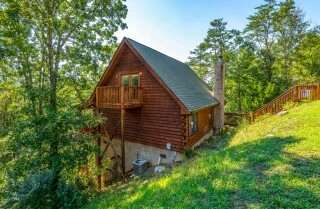 You’ll also enjoy access to a washer and dryer inside this cabin, making the clean-up process even easier. Knotty Desire is a beautiful cabin set amongst the Smoky Mountain trees, and you’ll want to spend some time soaking in the sights and sounds of the great outdoors during your stay. So be sure to take advantage of this cabin’s outdoor spaces, including multiple porches with rocking chairs (2), deck chairs (2), and small tables for drinks. 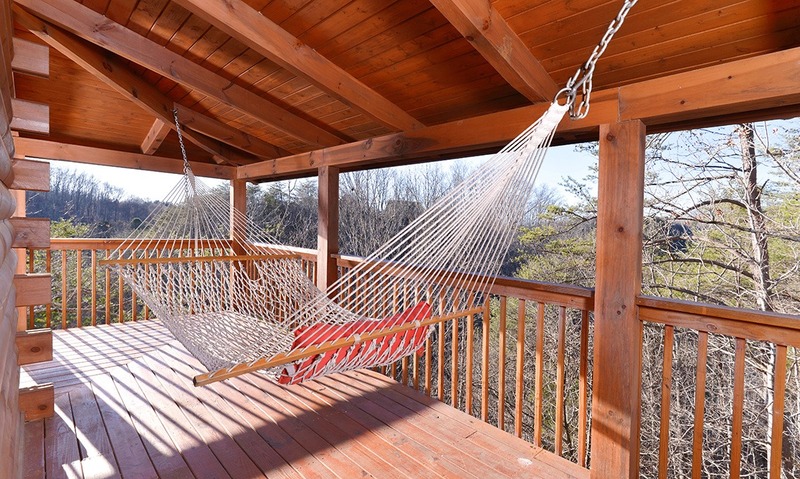 There’s also a hammock suspended on the porch for the ultimate way to relax. You can catch some Zs in the fresh mountain air or take a relaxing soak in the cabin’s outdoor hot tub. Knotty Desire puts the beauty of the Smokies right at your fingertips! 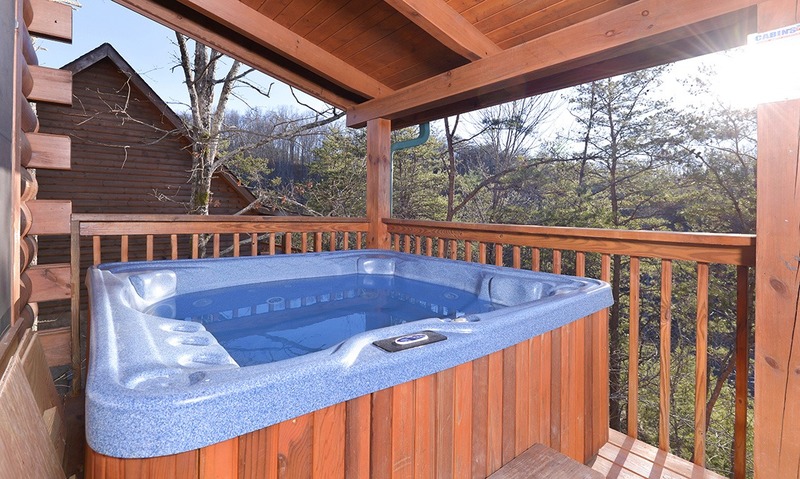 To make your Smoky Mountain stay even more convenient and fun, Knotty Desire features some extra amenities like a gas grill and free Wi-Fi, which you are free to use during your stay. The gas grill makes family barbecue night easy and affordable in Pigeon Forge. And be sure to use the free Wi-Fi to keep up with our Cabins for YOU blog. 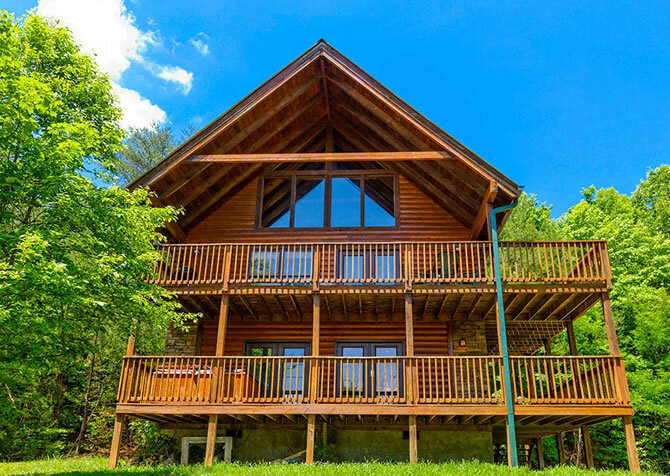 Each week we post up-to-date information on Smoky Mountain events and attractions so you can make the most of your visit to Pigeon Forge. 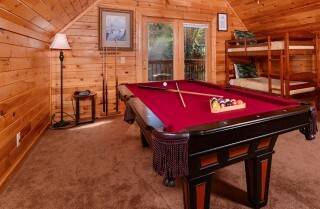 Besides all this, Knotty Desire offers free pool access—a must-have during the spring and summer! 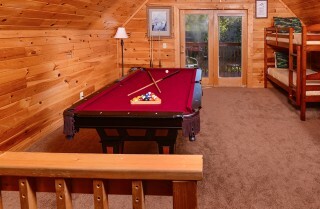 This is the perfect way to beat the heat with your group and make special memories in the mountains. Great for kids and adults alike, the NASCAR SpeedPark features 22 family-friendly attractions, including 8 go-kart tracks, 10 thrill rides, and 2 mini golf courses. Enjoy an up-close look at Quarter Horses and Palomino breeds before the exciting show at the Stampede. And, of course, the 4-course Southern feast is worth the drive to Pigeon Forge! You can spend a full day at Dollywood and not experience everything this amusement park has in store. 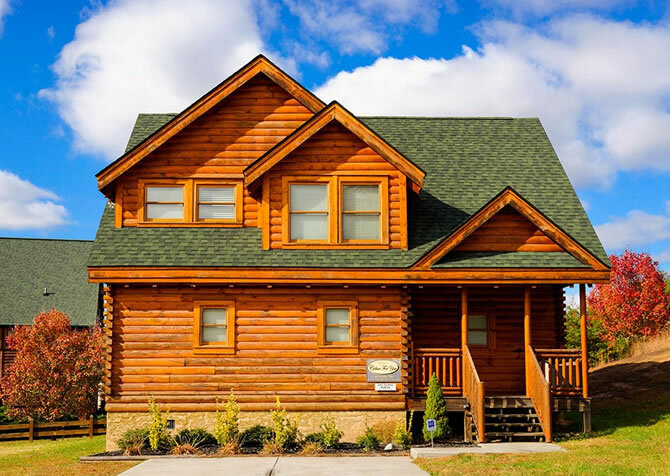 From live shows to thrilling roller coasters, this favorite Pigeon Forge attraction has it all! 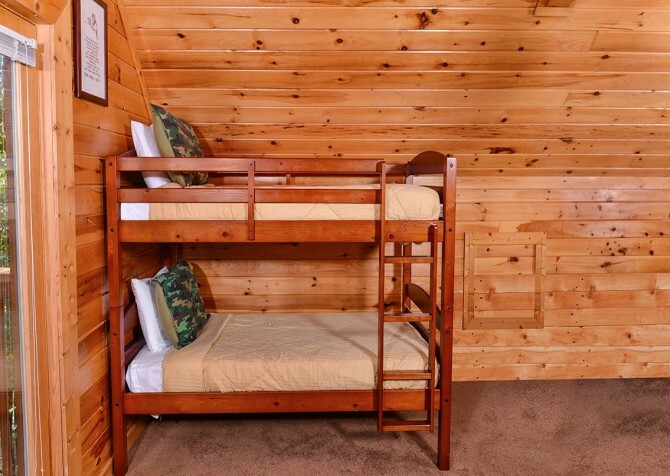 "We stayed at this cabin last month and it is like new. Very clean and filled with amenities. Highly recommended!"